It’s not uncommon for preppers to use the terms Go Bag’ and Bug Out Bag as if they were the same thing. But the reality is that a Go Bag and Bug Out Bag are two vastly different setups. They each have different intended purposes, but at the same time, neither is less or more important than the other. If you’ve already put together a personal Bug Out Bag, great! But if you don’t have, a Go Bag put together yet, or if you thought that a Bug Out Bag was the same as a Go Bag, then you’re going to need to put your Go Bag together now. 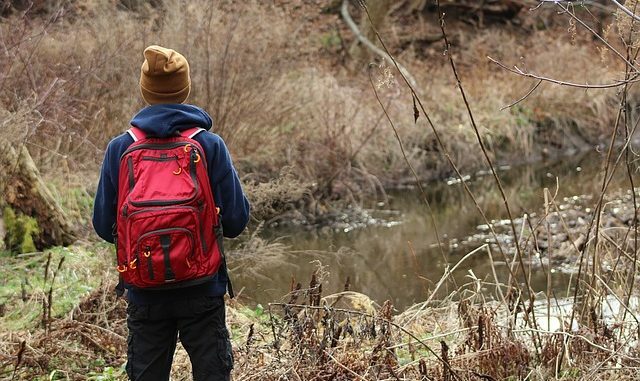 o, what’s the difference between a Bug Out Bag and a Go Bag? A Bug Out Bag is a larger pack designed to hold enough gear and supplies to last you multiple days. Bug Out Bags are often referred to as three-day survival bags or 72-hour packs. When you need to bug out of your home, your Bug Out Bag is what you carry with you. It’s much heavier and larger than a Go Bag and generally contains items meant for survival in the wilderness. In contrast to this, the Go Bag is a much smaller and lighter bag that contains items that are more essential. It’s not designed to keep you alive for multiple days in a survival situation, but rather to serve as your emergency response bag if a disaster happens now and you need certain items to get you home. The first thing you need is a good pair of reliable boots, which can be tied to the outside of the bag, to save space, rather than stored inside of it. Boots or at least sturdy shoes in your go bag can be lifesaving if you happen to be wearing shoes unsuitable for walking long distances, such as heels or flip-flops. Having a pair of boots with your go bag guarantees that you will always have a pair of footwear with you that provide protection and good traction. You would also be wise to include a pair of comfortable socks. I really like Dickie’s Socks. They are durable, comfortable, and inexpensive, and look good enough to wear with office shoes as well as sneakers or boots. Save space in your go bag, wear them regularly, and keep an extra pair stuffed into your boots in your go bag. While a jacket or sweatshirt to takes up more room in a go bag, it will be worth it. Sure, it may be hot and sunny out when disaster hits, but keep in mind that a storm or chilly night could develop before you make it back home. If that happens, you’ll be glad you had a jacket with you. Use every bit of space wisely. What small items can be stashed in the pockets? Dewalt makes a nice series of safety glasses with dark or mirrored lenses that double as sunglasses. I own three pairs, and have found they are a very good middle ground between paying a lot of money for Oakley’s, (which are fine glasses, but for the price they charge, I would sob with rage if I lost a pair) vs wasting money on cheaply constructed Department store or drug store sunglasses. They are durable; they protect your eyes from sun, wind, and debris, and look good. Besides, with a name like Dominator, or Reinforcer, these sunglasses have automatic coolness points. . That is almost as good as calling them Tactical Sunglasses. Have you ever noticed that if the manufacture r calls something tactical, it is suddenly cool to own? I seriously think you could make chocolate chip cookies, put a few in a black or camouflage Ziploc bag, and label them as TCRD’s (Tactical Calorie Replacement Discs), and you could sell twice as many at three times the price. This may be the most clichéd survival item of all time, but no go bag is complete without one. Go with a folding tactical knife with an ergonomic grip and a sharp, serrated blade, and a clip to carry it securely in your pocket. A folding knife is better than a fixed blade for a go bag because it’s more lightweight and takes up less space. A small LED flashlight with a bright beam (along with extra batteries or even one that is hand-crank) is a must. Go with a small metal model with a clip that can be secured to the inside of your pocket if necessary, just like your knife. Wrap some duct tape around the flashlight, as duct tape as so many uses. Some preppers like to keep a handgun in their go bag while others don’t. On one hand, a handgun provides you with a means of self-defense in a dangerous environment. On the flip side, it takes up space and bulk in your go bag. If you already have a concealed weapon on your person as part of your everyday carry kit or EDC, you may not need one in your go bag. Whether you choose to have a gun in your go bag is entirely up to you, but if you do have one, make sure it’s reliable, chambered in a common caliber, and compact enough to be hidden on your person if needed. It should be large enough to fight with, and you should carry at least one spare magazine or speed loader with it. A BTN (Better than Nothing) alternative to a firearm is pepper spray, either a canister or firearm–frame type delivery system. On choice is the Mace Pepper gun, pictured below. 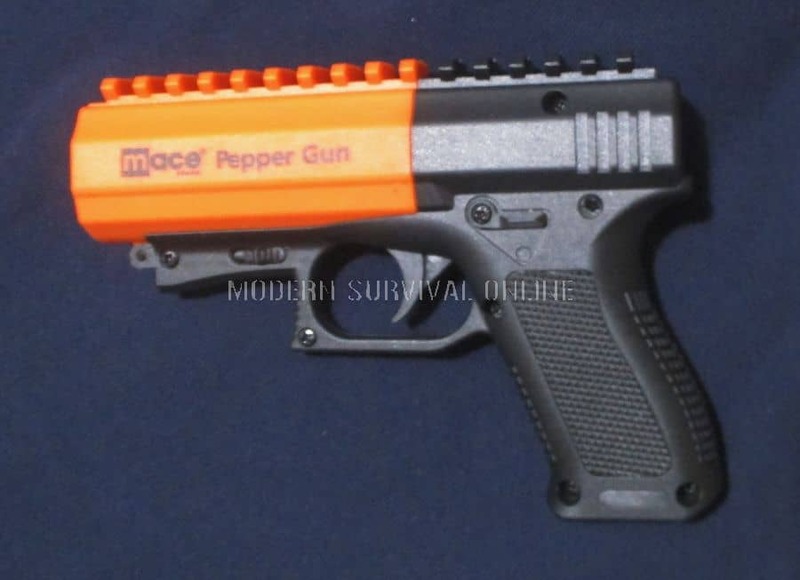 The Mace pepper gun is a reloadable OC delivery system that can spray a high-pressure stream of OC about 20 feet. It comes with a practice canister of water, and you can order additional OC or practice H2O cartridges. It is made from a tough polymer, has rudimentary sights, and a LED light. It can accept accessories such as a laser sight, and only weighs 12.8 oz. Everyone knows the importance of having water in a survival situation. Water is essential to keep you hydrated, quench your thirst, and to aid in cleaning an open wound. Rotate the water in your go bag out at least once every month, (ummm… just drink it as you will presumably need to drink water at some point) and include a small filter or purification tablets with it (in case you need more when you’re on the run). Wrap more duct tape around the water bottle. A metal water bottle can also be used to go all Little Bunny Foo-Foo on someone’s head if the situation requires it. (Only bad guys who are intent on hurting you and cannot be reasoned with or de-escalated) . 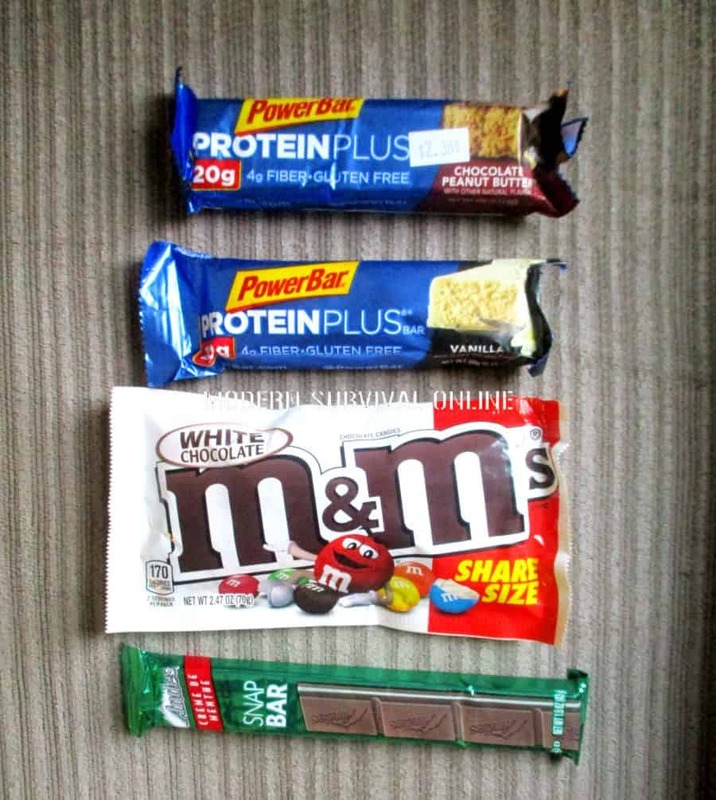 My favorites from top to bottom: Power Bar Protein Plus chocolate peanut butter, Power Bar protein Plus vanilla, White chocolate M & M’s, and Andes Chocolate mint snap bar. Your go bag won’t be big enough to fit an entire meal and you can manage 24 hours or much longer without food if necessary, but you can at least pack a protein bar or two or some candy to give you a quick burst of energy or to calm your rumbling stomach. Food in your go bag is more of a comfort item than a necessity, unless you are diabetic or have other health issues that require regular nourishment. Something that tastes good is also comforting and can refresh you and give you the mindset to keep going. Keep a variety of bills ($1s, $5s, $10s, and $20s) in a waterproof case or bag within your go bag. You may need cash if ATM’s are down. Include some quarters and dollar coins. A lighter is simply your easiest method to get a fire going and it can also serve as a backup source of light to your flashlight in a pinch. Alternatively, you could carry a magnesium flint striker or a box of waterproof matches (or a combination of those things). NOTE: in addition to your lighter, you should also include something that’s highly flammable so you can get a fire going quickly. Cotton balls soaked in Vaseline and then sealed in an airtight container are a good option, so is dryer lint. Like the knife, the bandana is a a very clichéd survival item but it’s also among the most versatile. You can use it as a tourniquet, wrap around your mouth and nose to keep dust out, use it as a cool compress if you have a headache, as a napkin, and so on. Besides, it takes up virtually no space or weight anyway, so why not include it? To use space efficiently, wrap it around your water bottle. Even if you think maps are outdated in comparison to a GPS, include a physical map in your go bag instead. Your GPS only works while your batteries last and if satellite communications are not impacted. Your map works as long as you can keep it from being burned or wet. Make sure your map is a recent print and covers your entire city in addition to the surrounding area. Within your go bag needs to be a first aid kit that includes all the basic medical items such as Include ibuprofen, Tylenol, aspirin, antihistamines, pepto bismo, Quik-Clot pad or hemostatic powder, scissors, 4 x4 bandages, assorted Band-Aids, tape, tweezers, and tourniquets. It doesn’t have to be a complete medical kit (which would take up too much room to be a separate bag on its own), but it does need to include all the basics and be enough to keep you comfortable or temporarily treat an injury until you make it home. Don’t forget training on how to use the contents. NOTE: include at least 72 hours’ worth of prescription medications in your go bag as well. Use recent bottles or keep a copy of the prescription. In many jurisdictions, possession of prescription meds, or unidentified med can cause unneeded complications with law enforcement. You also need to be able to quickly identify your meds if you have multiple types. This is simply for taking notes as you go. Keep the paper in the form of a notebook and consider carrying a Sharpie or thick marker in addition to a pen. The notebook should be sealed in a waterproof bag or container. You never know when you’ll have to go, and while it will be inconvenient to have to while working your way home in the middle of an urban disaster, it’s definitely better to be prepared then not to be. You’ll live without it but it’s a nice comfort item. Keep at least a small roll sealed in a waterproof bag. Have a written list of all ways to contact your friends and family members who live in the city and in the surrounding area. This include home phone numbers, cell phone numbers, e-mail addresses, social media information, home and work addresses, and whatever else you can think of. A few little items that can boost morale and comfort, and won’t take up much space or weight. As you can tell, your go bag will be a lot less complete than your bug out bag. But it’s supposed to be that way. The purpose of your go bag is not to survive for an extended period, but rather to keep you alive and comfortable while you’re working your way home in the middle of a sudden urban disaster. As we said earlier, it’s the bag that you use to get home to your bug out bag. You want your go bag to be light so that your mobility and agility are not at all hindered by it. Include only the most essential items and a few comfort items. If you can think of anything else that you feel needs to be included without adding too much weight and that you feel could increase your chances of survival in your area, go ahead and add it. But the list you have read is a good place to start and you’ll want to include as many of these items as you can. A good knife, flashlight, lighter (or fire steel), boots, bandana, cash, and a pen should be on your person at ALL times anyway. But, you can always carry redundant items in your bag (a fixed blade knife, brighter flashlight, etc). I carry all that as my EDC. Keys. ,ever lose your keys?